This collection of fandom inspired knits is just fantastic. Toni Carr got contributions from other designers and put lots of her own patterns in the book. There is a good range of skill levels as well, so beginners will have patterns they can use, and more advanced knitters will also find some lovely lace items. The patterns are written out clearly with fun photos of finished items modeled by roller derby girls at Neil Gaiman's house. As a long time geek, I was thrilled with the books and movies covered. The Lord of the Rings inspired Toni Carr's pair of hobbit slippers and Ashley Fay's Light of Eärendil Shrug, a lacy ethereal shrug patterned with leaves. Neil Gaiman's Death and Mr. Nancy both make an appearance in felted knit hats. A tiny top hat for Death and a bright green fedora for Mr. Nancy. Firefly makes a strong showing with the Aim to Misbehave Brown Jacket, cunning socks and a cunning scarf. Star Trek is covered with a Next Generation sweater, an original series mini dress and tribbles. 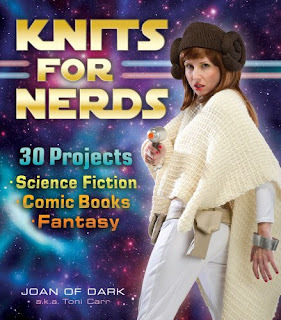 Also covered are Doctor Horrible, Real Genius, The Big Bang Theory, Temeraire, Harry Potter, Wicked Lovely, Star Wars, and Doctor Who in a variety of projects like fingerless gloves, stuffies, sweaters, shawls and bags. For the male geek, there is a unisex Harry Potter inspired book bag, a sweater that looks like a Star Trek- The Next Generation Uniform, a wonderful cabled sweater vest and Mr. Nancy's Hat. The end of the book includes a key to commonly used knitting abbreviations, and an overview of how to knit with photographs. My daughter, who is a proud nerd and fan, and who loves to knit snatched this up as soon as we got it, and took it for 3 hours. She chortled and giggled and got very enthused. Her favorite patterns are the above mentioned green fedora, the cape pictured on the cover, and Aim to Misbehave jacket, which is a lovely longer jacket for Browncoat fans and the Big Bang Theory Raj inspired cabled sweater vest. My favorite projects are the shrug mentioned above, the Super Awesome Fantastic Mega Super Cute Manga Leg Warmers which are flared to look just like illustrated chibi style legs, the colorful Tank Girl socks (I love Tank Girl! ), and the adorable, quick to knit, button eyed Creepy Filler Bunny.